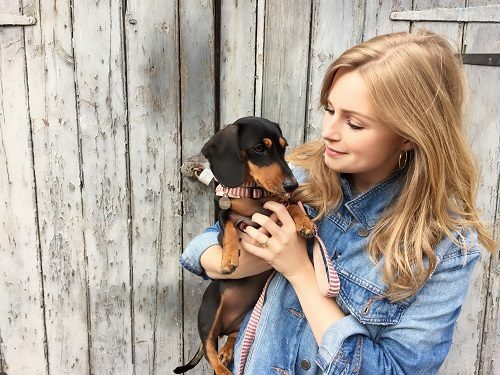 As K9 Magazine prepares to launch a festive series with Nicola exploring her homemade recipes, we wanted to find out all about her four legged friend who has been giving the seal of approval to her dog treat recipes. Darcey is a black and tan miniature dachshund. Ball obsessed, entirely food orientated and extremely intelligent. She’s a little bundle of fun. I used to live in a flat and I taught her to ring a reception bell if she needed to go outside; she's now taken to using it as mechanism to let me know she wants to play! I’ve always had pets since I was a baby. As a toddler I had two cats, Corrie and Tigger followed by two more, Meeko and Tasmin and now my family have Willum and Lily. Since the age of eight or nine I’ve had fish, hamsters and gerbils. We were always a pet orientated family; they give so much back in return. Readers might recognise you as 'Ella Dawson' from Sky 1's 'Mount Pleasant' which we're thrilled is back on TV. The last season finished on a pretty high note for Ella's family after the family were embroiled in a seige alongside their neighbours so what can we expect to see this season? There’s a new family on the close this year and Ella is at university. She starts hanging out with the neighbours son Finn and needless to say, as a twenty something girl with a pretty messed up family things start to go a little crazy! What, or perhaps who, inspired you to get into acting? I’ve always enjoyed Acting and was always a part of school plays but I was on the road to becoming a ballerina. It was my Drama teacher Rhoderi at secondary school who really pushed me and made me audition for Drama School. I got in and never looked back. As well as acting you have a passion for cooking healthy, guilt free dishes which saw 'Milly Cookbook' born. We're so excited to be working with you to deliver tasty dog treat recipes to our readers over the coming months, so we have to ask...what's the secret to the perfect dish? Preparation is key! Know what you’re going to cook, plan it and have everything out ready and prepared so there’s no chance of burning anything or getting your timings wrong. Just experiment! Some of my best dishes materialised from messing about in the kitchen on a day off and they’ve ended up being my most successful. Get creative. Do you have a motto that you live your life by? What would you say Darcey's motto might be? Mine would be ‘What’s meant for you won’t pass you by’ and Darcey’s would probably be something along the lines of ‘What’s yours is mine and what’s mine is mine!’. If you were to swap roles with Darcey for a day, how do you think she'd cope being you and what would you love most about being her? Honestly, she’d love all the attention. She’s such a friendly dog, she loves everyone. I on the other hand wouldn’t mind her day at all, a leisurely walk around London, food, afternoon nap go to the pub and get biscuits and loads of attention, food and sleep again. Hard life. Rick Stein (who's dog Chalky was a constant companion on TV shows) – I think he would be a Norwich Terrier. Tom Hardy (his dog Woody seems to be by his side for most of his current film promotion) – I think he would be a Bulldog cross Pug. Gemma Merna (past K9 Magazine cover star, who owns two St Bernards and a Westie) – I think she would be a Poodle. James Martin (who owns a Clumber Spaniel named Fudge and has also previously featured in K9 Magazine talking all things dog) – I think he would be a Golden Retriever. Now onto some of our quick fire questions, are you ready? Big dogs or little dogs – I'd say little dogs. Pedigree dogs or cross-breeds – I can't decide, can I say both? Days off or days at work – Days at work. While making my Milly Cookbook peanut butter dog biscuits I gave Darcey a spoon of peanut butter...she licked her nose for a good 20 minutes! TV show – Mount Pleasant (of course!) ­ Sky 1, Friday nights at 9pm. Book – One Hundred Years of Solitude by Gabriel García Márquez. His writing is beautifully poetic. Film – ​I should say something like 'The Shawshank Redemption' in my profession but it has to be '500 Days of Summer' ­ it's an absolute chick flick and not something I should mention as an 'actor' but I’m unconventional. I could watch it every week and from any point. There’s a beautiful colour palette throughout the film, a lovely story and great music. I never tire of it. I​ very nearly went on 'Stars in their Eyes'. Nearly. With two of your passions in mind – cooking and acting – if you were arranging a dinner party and could invite those best known for their acting or cooking, who would you invite and why? Genarro ­ he’s a hoot and a great chef, Edie Sedgwick for her magnetism and charisma. Stephen Fry for endless intelligent banter and my co­star and fellow dog lover James Dreyfus, because he could fart and I’d still find it funny. Finally I'd invite Nigella for her constant innuendos and who I’d ask to bring one of her utterly decadent, chocolate cakes for pudding. ​The absolute, unconditional love they have for you. No matter what I look like, what mood I’m in, how busy I am, Darcey is always happy to see me and always wants to climb into my arms for a cuddle. She makes me feel like I’m doing a really good job with her. Finish the following sentence, my dog is...a ball crazy, lovable lunatic. And finally, this is always a tough question and often requires a fair degree of thinking time but…if Darcey had the ability to speak and answer one question and one question only, what would you ask her and what do you think that she would say? I would want to ask her if she’s happy. I think she’d say 'yes, can I have a brother or a sister? … and where’s my ball?! '.